Since 1951, generations of the world’s most talented classical musicians have come together to participate in Marlboro Music, a seven-week summer festival where young musicians collaborate alongside master artists in an environment removed from the pressures of performance. Located on the tiny campus of Marlboro College, Marlboro Music encompasses not just music but a communal way of living. The New Yorker magazine calls Marlboro Music “the classical world’s most coveted retreat,” and participants have included such celebrated musicians as cellists Yo-Yo Ma and Pablo Casals, pianist Emanuel Ax and violinist Joshua Bell. With a shortage of residential space for senior musicians, Marlboro Music developed plans for five new cottages on a 15-acre site adjacent to the college. 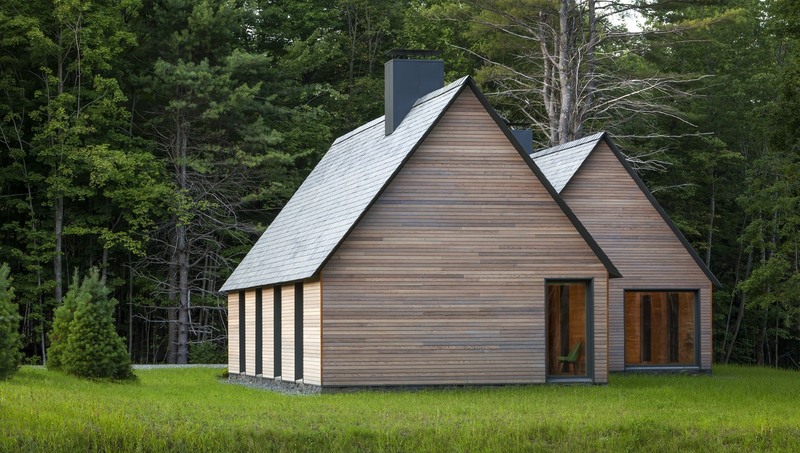 The design was inspired by a Cape Cod cottage; born of necessity with an aesthetic of restraint, this simple gabled form is closely tied to Marlboro’s identity and became the design template for the project. 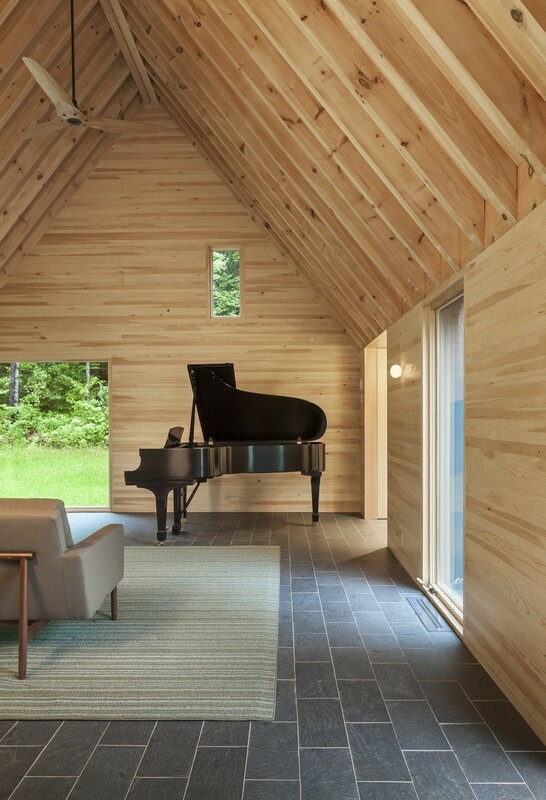 The cottage’s small footprints, sloped roofs, compact volumes and indigenous materials reinforce Marlboro Music’s place amidst the lush Vermont landscape of rolling hills and streams. 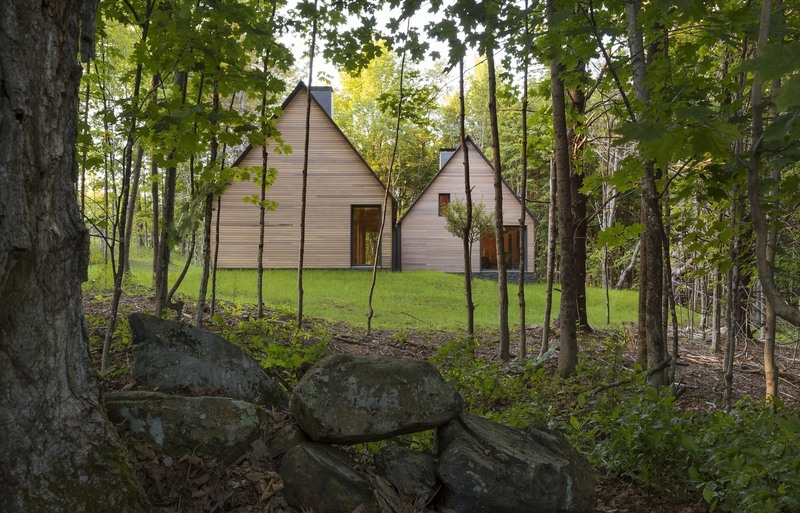 Rather than mimic the Cape’s ubiquitous white clapboard, each cottage is clad in red cedar siding to blend into the woodland site. 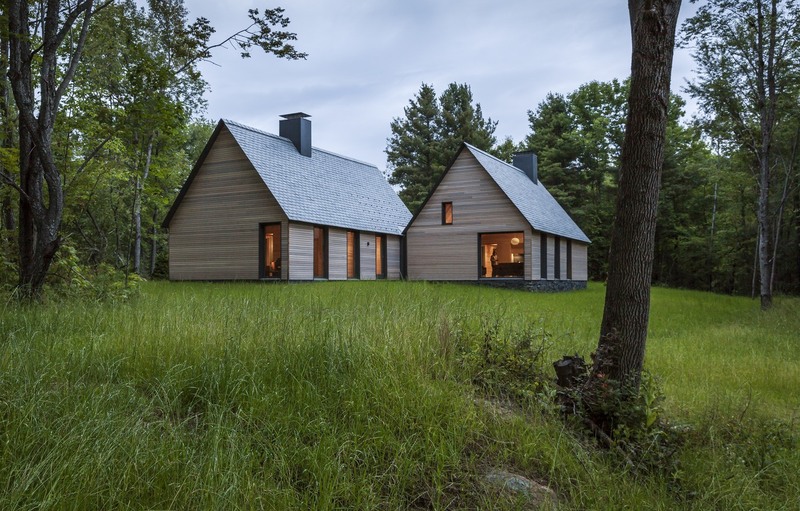 On the inside, while traditional Capes were dark, introverted spaces, the new cottages invert this paradigm with large windows that frame views of the forest and fill each room with abundant daylight. Operable windows combined with overhead ceiling fans eliminate the need for air conditioning, allowing fresh summer breezes inside. Spatially, what would have been traditionally seven-foot high ceilings open up to a gabled form, adding volume to the small spaces and providing an acoustically tuned space for playing music. 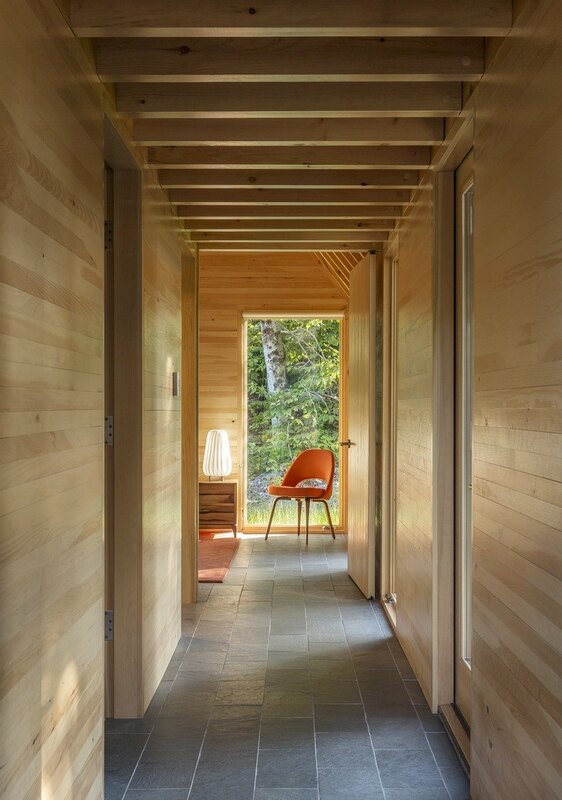 And locally-sourced white pine walls/ceilings and Vermont slate floors with in-floor radiant heat make up a simple and durable palette of natural materials inside. 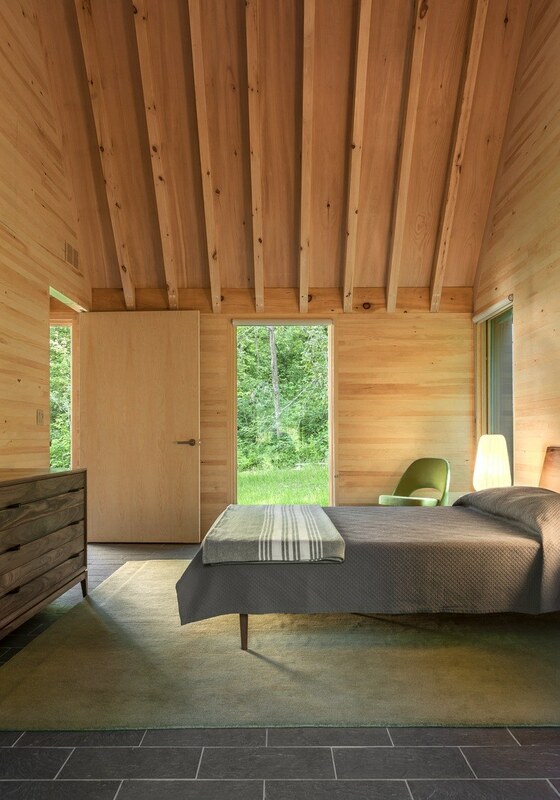 The new cottages preserve the bucolic nature of the surrounding area while being responsive to the needs of the musicians and 21st century life. Arranged around meandering 150-year old stone site walls, each cottage is oriented to minimize site disturbance, take advantage of forest and wetland views, and maximize daylight. An old logging road was repurposed to access each cottage, and all storm water is managed on site through swales and a water retention basin. New native plant species require no irrigation and little maintenance; over time, the forest will continue to grow up around the cottages, blending the forms seamlessly into the natural landscape.